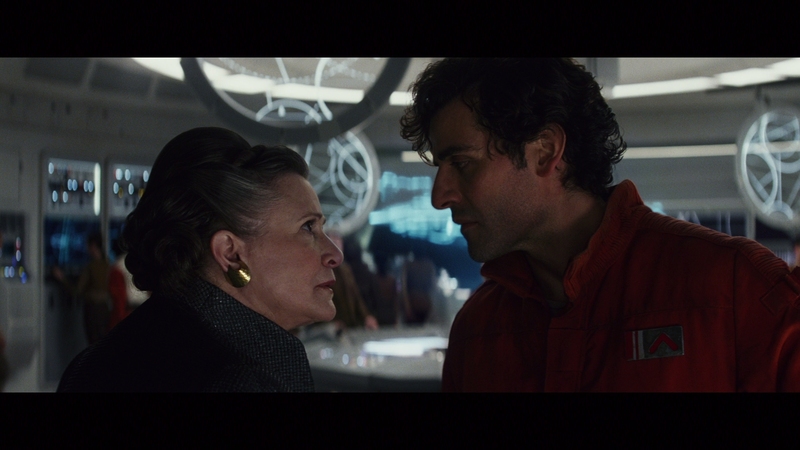 On repeat viewings, Last Jedi further falls from Star Wars pantheon. It’s a needless film, progressing neither the larger story nor the individual characters. It’s the manifestation of a writer’s room brawl, where the spiteful winner decided to overwrite what came before, no matter the cost to decades of lore. Tone limps along, perking up with grating comedy beats, then asking for drama later. 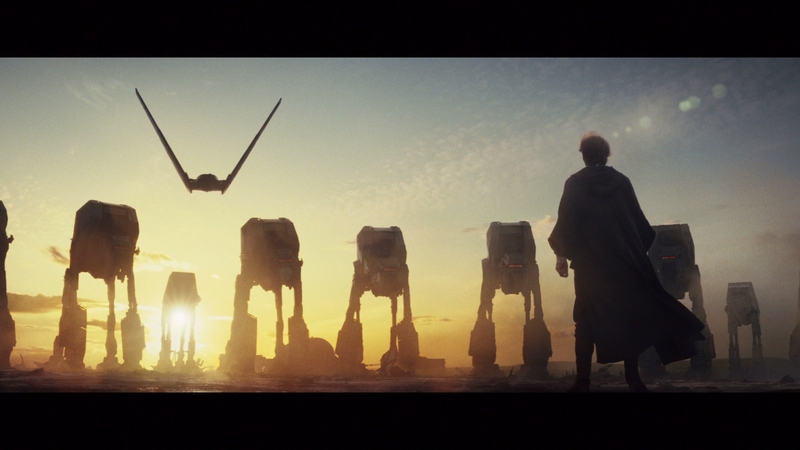 Last Jedi is such a contained film, so short on scale as to feel like a side story. Like Episode I, there’s a killer lightsaber brawl and gorgeously photographed finale that’s the best of everything Star Wars, but the rest collapses, choking on a lack of ambition. Read our full Last Jedi review for more. 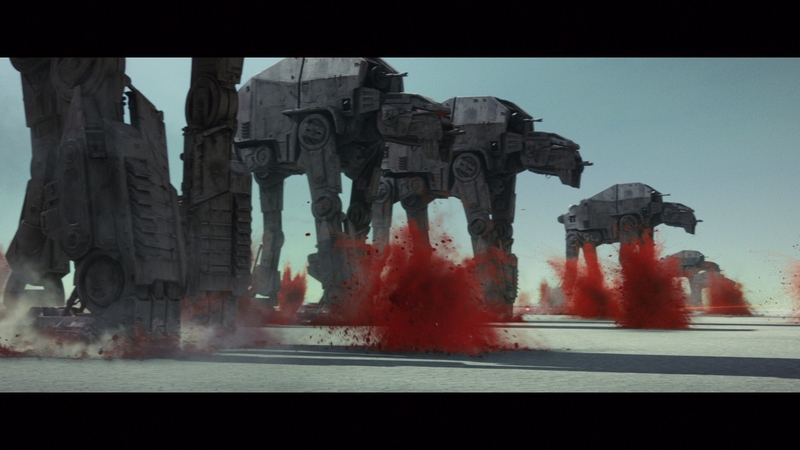 Shot on a variety of formats with a 4K finish, the results certainly brush Last Jedi with stellar definition. Close-ups resolve high-grade facial definition with aplomb. Costumes and worn ship interiors resolve all of the minutiae put into their design. The real breath taking material concerns scenery fly-bys, showing every ripple of waves and every crevice in rock formations. Even CG sets, rendered at 2K, look splendid. A mild grain remains consistent, hiding the differences between digital and film cleanly. Disney’s encode shows no struggle in maintaining clarity. Behind that is an often dour film, tonally pleasing in terms of color though. 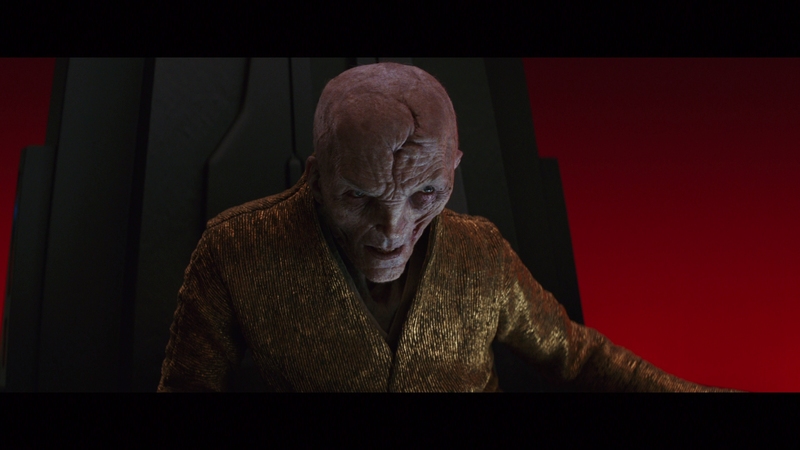 Greenery shines and the dazzling reds in Snoke’s throne room both stand out and add a challenge for the encode. No worry – not a bit of artifacting shows. 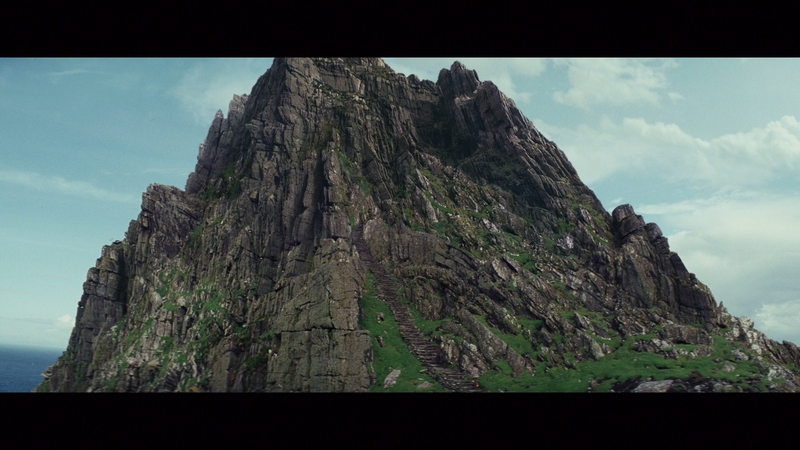 As the first Star Wars on this format, Last Jedi does (somewhat) serve as a preview. If that’s the case, bring on more HDR lightsabers. The crackling beams show off grand brightness, adding bite and power to the already awesome duels. 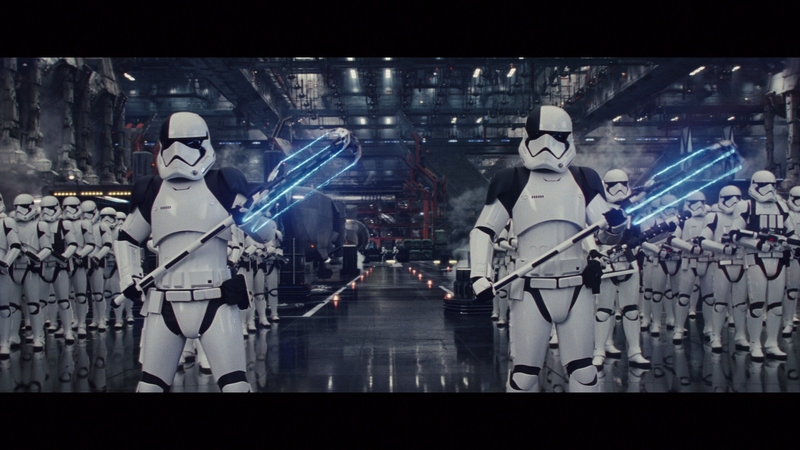 Likewise, lasers and explosions pop from the screen. What’s missing though? Black levels. Although true black is utilized, it’s rarely at full impact. 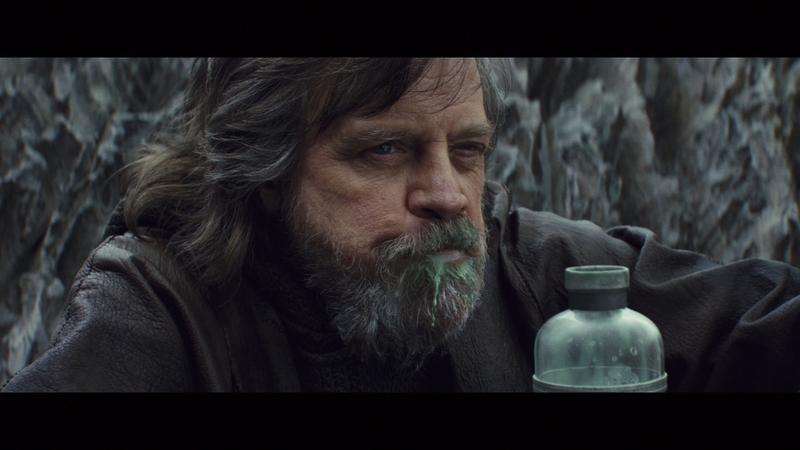 There’s a loss of density, especially scenes with Mark Hamill, considering his possible future in the shadows. 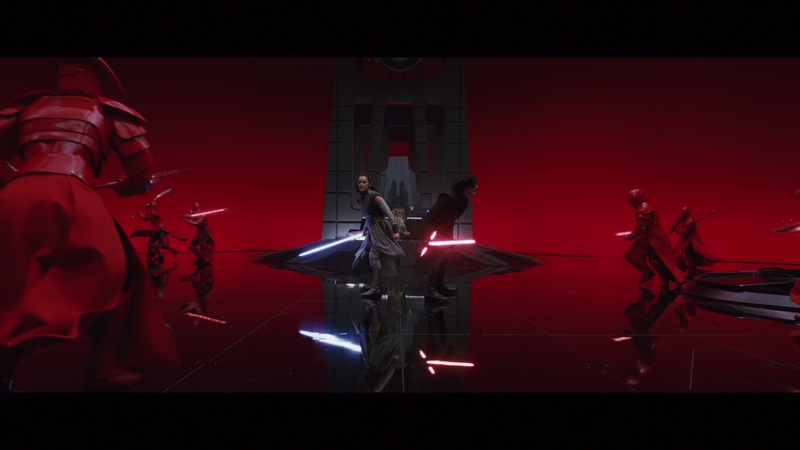 Those shadows waver toward gray or even blue, dampening Last Jedi’s visual prowess. The same goes for space. 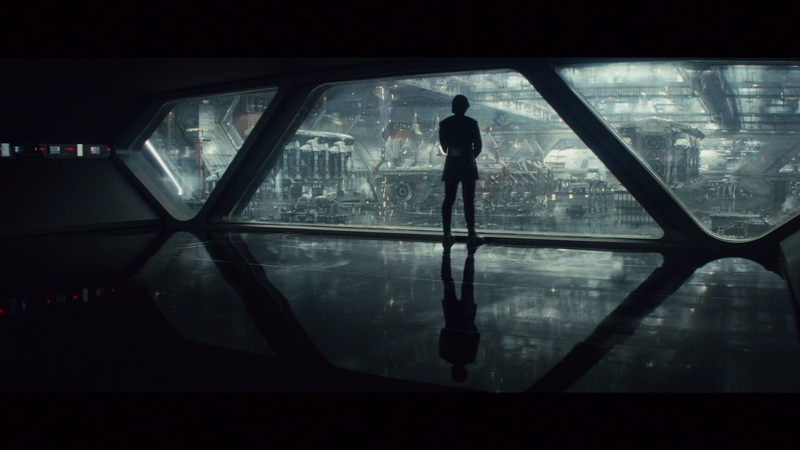 After the opening text crawl and into those images of First Order ships hovering in space, the lack of true black stand outs in a negative way. Bright and chipper, the Blu-ray edition uses the 4K master well with a strong down conversion avoiding any pitfalls. Even on the fine lines of Star Destroyers, Last Jedi doesn’t fall to aliasing or shimmering. That’s great work. Great color highlights the Ireland location shoot, with expansive greenery, gorgeous oceans, and burning sunsets. 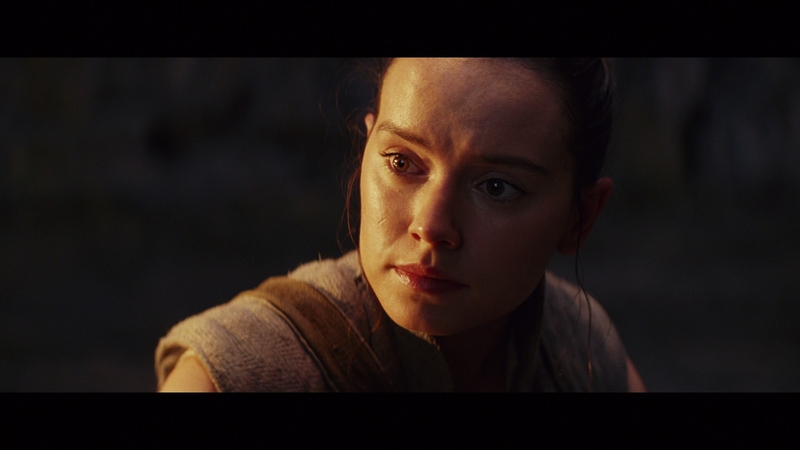 The same goes for the Blu-ray as with the UHD: Black levels fails to play nice, falling off into grays and leaving Last Jedi without the full range it seems to aim for. The two formats create a duel between audio formats. The Blu-ray sticks with last generation DTS-HD (in 7.1) while the UHD offers Dolby Atmos. The trend continues of unnecessarily handicapping the Blu-ray. It’s absurd. Regardless, both mixes offer powerful range, rocking the low-end with intense explosions from the outset. That doesn’t stop. It’s a powerful, thick audio track, hitting bass cues and giving any home theater a suitable, well-sized shake. Any action scene holds up as a premiere example of high-dollar studio mixing, including the stampede through the casino. Positional use spreads wide (and frequently), keeping ships moving between channels and overhead. Tie Fighters sweep and world building plays a role too. 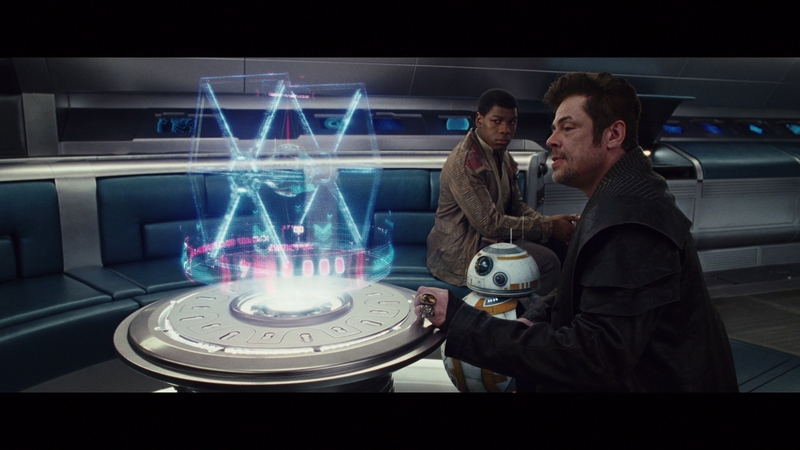 Inside command centers, computers beep and voices pan, selling the idea of Last Jedi’s available space. Subtly isn’t lost either. 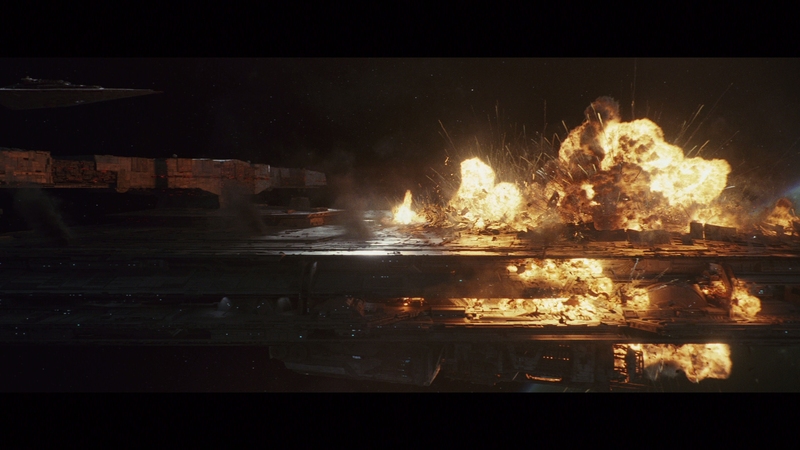 During the final battle, under the bombastic laser fire and ship engines firing full, you can still hear the turned up salt being thrown into the rears. Awesome work. Bonus features seemed dead on home media to big studios. If they were included at all on mainstream releases in recent years, they steered toward the generic. Last Jedi destroys those expectations. Beginning with director Rian Johnson’s commentary (only available on the Blu-ray sadly), an additional bonus disc comes with Director and the Jedi. It’s a spectacular look into the production and easily the best feature length, making-of documentary of the past few years. From there, quality continues. 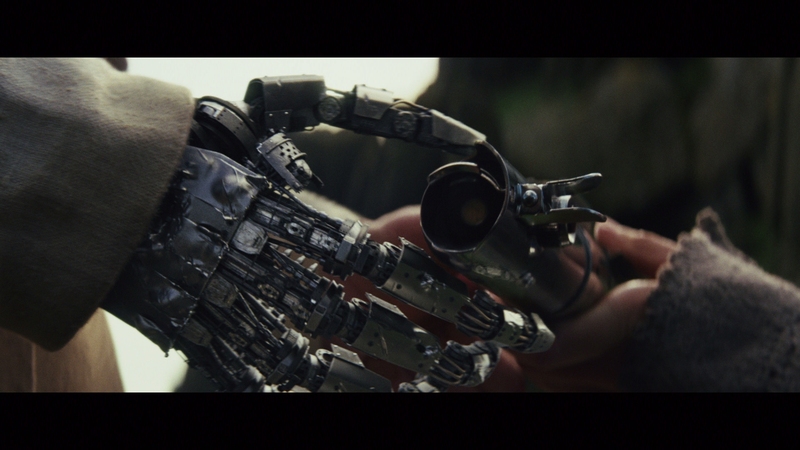 Johnson delves into what the Force is to him in Balance of the Force. It’s brief comparatively (10 minutes), but has depth. A half-hour of scene breakdowns eschew the typical formula for another documentary style look at how key scenes came together. Untouched footage of Andy Serkis acting out Snoke is a neat behind-the-scenes look at his performance. Even the list of deleted scenes excel, with an optional commentary with Johnson describing the cuts. These run 23-minutes. Everything on this disc is worth watching. Twice, in some cases. 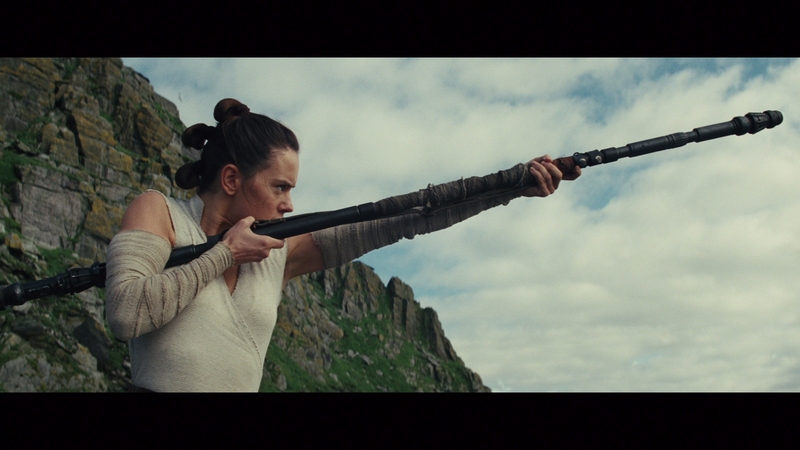 There’s a universe of potential stories and characters in The Last Jedi, but this latest Star Wars narrows its view to a small pocket of space with no room to maneuver. The 15 unaltered images below represent the Blu-ray. 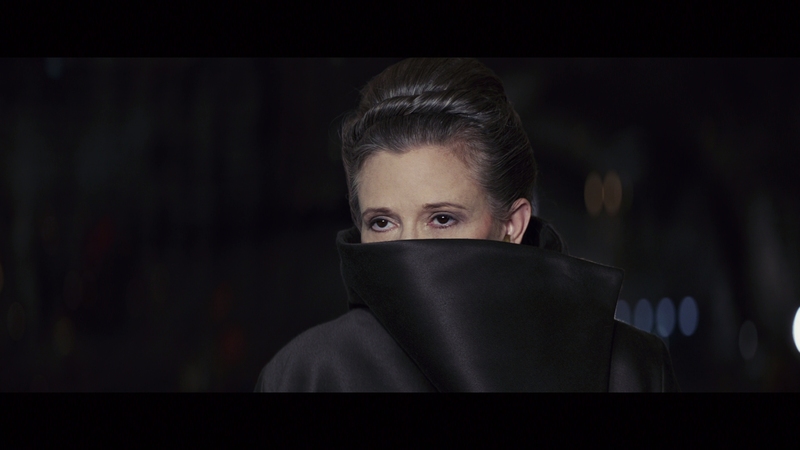 For an additional 58 The Last Jedi uncompressed screenshots, early access to all screens (plus the 10,000+ already in our library), exclusive 4K UHD reviews, and more, support us on Patreon.